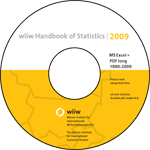 Tables permit a wide range of individual analyses and compilations with time series covering the whole period 1990-2008. These two presentations allow a more flexible use for own purposes. Additionally the hardcopy and the PDF long version is provided to view graphs and preface.